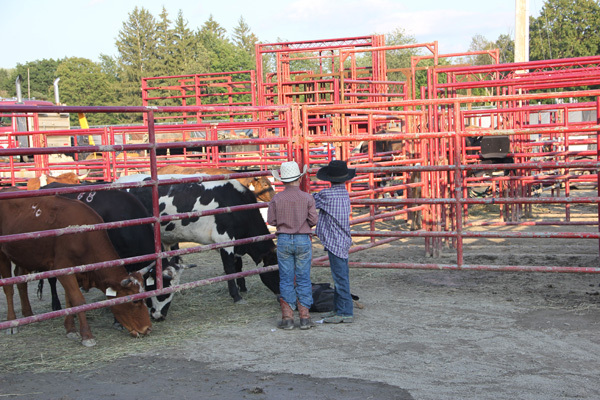 Even the smallest cowboys participate in the Painted Pony Championship Rodeo Sept. 3 at 5 p.m. in front of the grandstand. The 178th Columbia County Fair brings the summer to an unofficial close Aug. 29 through Labor Day, Sept. 3 with six days of entertainment, food, agriculture and exhibits at the fairgrounds at the junction of Routes 66 and 203. Opening day, Aug. 29, gates swing open at noon and close at 11 p.m. Aug. 30 through Sept. 3, the fair opens daily at 10 a.m. and closes at 11 p.m. Admission includes parking and children ages 12 and under are admitted free each day. Active military personnel with ID or in uniform are admitted free daily. Adult admission each day except Sunday, Sept. 2 is $10. On Sept. 2, adult admission is $15 as country music sensation Parmalee performs two shows in front of the grandstand at 3 p.m. and 7 p.m. On Aug. 30, youths ages 18 and under are admitted free until 4 p.m. and seniors ages 62 and over are admitted for half price until 4 p.m. as part of Youth and Senior Citizen Day. A special ride pass will be available for $20 from noon to closing at 11 p.m. Free wheelchairs, courtesy of Barnwell Nursing and Rehabilitation Center in Valatie, are available. Amusements of America will offer more than 30 midway rides this year, including a wide selection for the youngest of fair patrons. All-day ride passes will be offered each day. Highlights for each day of the six-day fair include: Wednesday, Aug. 29 with the Demolition Derby starting at 6:30 p.m. in front of the grandstand presented by Stoney Roberts Productions. The first night of the derby is sponsored by HudsonValley360.com as part of HudsonValley360.com Day. A special hand stamp for amusement rides will be available for $15 from 1 p.m. to closing at 11 p.m. Columbia County’s Got Talent, an open talent show with Electric Blue DJ Service will start at noon for juniors, 2:30 p.m. for teens, 5 p.m. for adults and culminate in the finals at 7 p.m. with awards to follow. Thursday, Aug. 30 is WGNA FM 107.7 Day for Youth and Senior Citizen Day. The Demolition Derby Finale is at 6:30 p.m. sponsored by Madsen Overhead Doors and W & B Golf Carts, Inc. Youths and seniors get in at reduced prices and a special amusement ride hand stamp will be available for $20 from noon to closing. Friday, Aug. 31 is Columbia-Greene Community College Day with a special amusement ride hand stamp available for $20 from 10 a.m. to 11 p.m. The 82nd annual Schoolgirl Queen pageant steps off at 6 p.m. in front of the North Gate Stage featuring contestants from each of Columbia County’s six public high schools vying for the crown. Contestants are Jenna Skype, Miss Chatham; Leah Foster, Miss Germantown; Lindsay Klugo, Miss Hudson; Susanna Dolan, Miss Ichabod Crane; Natalie Zema, Miss New Lebanon and Brooke McComb, Miss Taconic Hills. Judging is based on personality, poise and appearance. The winner will be crowned by last year’s Schoolgirl Queen, Dakota Kubli of New Lebanon and receive a $500 prize. A new motorsport feature, SPI Professional Truck Pulling Series by Shootout Productions will be featured for the first time Aug. 31 at 6:30 p.m. featuring several different truck pulling classes in front of the grandstand. The day starts at 9 a.m. with the antique tractor pull in front of the grandstand. Saturday, Sept. 1 is A. Colarusso & Son, Inc. Day with a special amusement ride hand stamp for $20 from 10 a.m. to 11 p.m. The annual Firefighters’ Parade steps off at 11 a.m. sponsored by A. Colarusso & Son, Inc. and Stewart’s Shops featuring fire departments from Columbia and surrounding counties marching into the fairgrounds after parading through the Village of Chatham in an annual salute to our volunteers. The popular Monster Tractor Pull takes place in front of the grandstand at 4 p.m. sponsored by Hudson River Tractor Co. North Gate Stage entertainment features Tim Holland Ventriloquist at 1, 3 and 5 p.m. and the Extreme Illusionist and Escapes at 2, 4 and 7 p.m. The CorrieJ Mentalist Show will be at 6 p.m. and the CorrieJ Comedy Hypnosis Show will be performed at 8 p.m.
Sunday, Sept. 2 is Hudson River Bank & Trust Co. Foundation Day with a special amusement ride hand stamp in effect from 10 a.m. to 11 p.m. for $20. Country music sensations Parmalee perform two shows in front of the grandstand at 3 and 7 p.m. with hits including, “Hotdamalama,” “Close Your Eyes,” “Carolina” and more. The Records and Burpee Children’s Zoo runs continuously throughout the six-day fair. Music Box Productions Karaoke is featured in the Upper Entertainment Garden at 1 and 5 p.m., CorrieJ Mentalist Show at 3 p.m. and Allen & Azzaam from 6 to 10 p.m.
Monday, Sept. 3 is WRWD 106.9 FM/1230 AM Day with a special amusement ride hand stamp for $15 from noon to 11 p.m. Highlights of the day include an open horse show at 9 a.m. in the horse ring and the Ghent Band performing at 11:30 a.m. at the North Gate Stage. A continuous petting zoo by the Records & Burpee Zoo takes place daily. The Reverberators Duo performs from 1 to 5 p.m. in the Upper Entertainment Garden. The Painted Pony Championship Rodeo brings it home at 5 p.m. in front of the grandstand. Exhibits include school work, quilting, fruits and vegetables, photography, Grange, flowers, domestic arts and crafts, scarecrows, sunflowers, wool and a wide variety of 4-H displays and presentations to round out the six-day traditional fair. A Heritage Village features handcrafts of the past including wood carving, paper marbling, book binding, basket weaving and candle making. For more information go to www.columbiafair.com.